Multimedia artist and author Davis Schneiderman is up next in the New Writing Series. He’ll read from his work at the Soderberg auditorium on Thursday, October 2, 2008, at 4:30pm. Admission as always is free & the event is open to the public (though seating is limited). Watch Schneiderman take on Stephen Colbert below. 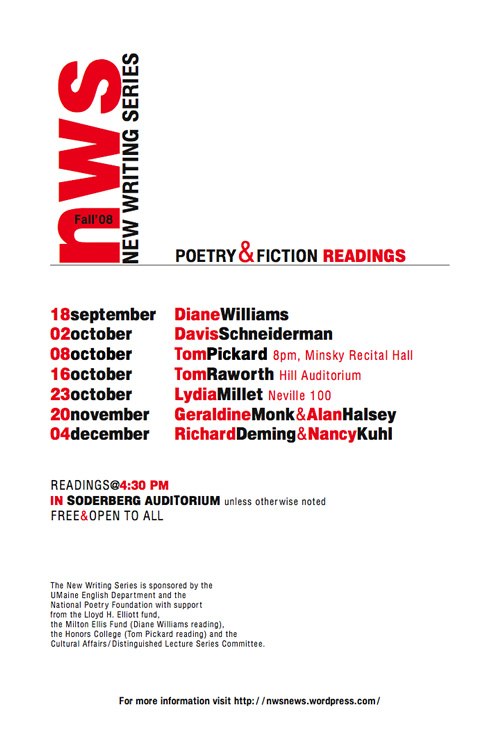 Andrew Prindle’s write up of the first New Writing Series event of the fall—Diane Williams’s reading on 18 September 2008—can be found here. The UMaine English Department & National Poetry Foundation are proud to announce this semester’s slate of innovative poetry and fiction readings at the University of Maine’s flagship campus in Orono. The UMaine New Writing Series is sponsored by the English Department and the National Poetry Foundation with support from the Lloyd H. Elliot fund, the Milton Ellis Fund (Diane Williams reading), the Honors College (Tom Pickard reading), and the Cultural Affairs/Distinguished Lecture Series Committee.